The list of publications below include some of the data available for the HeRO Graft. Many citations include hyperlinks to the abstracts. A full bibliography can be downloaded at the link below that contains over 50 publication citations. A comparison between the HeRO® Graft and conventional arteriovenous grafts in hemodialysis patients. Multi-center Experience of 164 Consecutive Hemodialysis Reliable Outflow (HeRO) Graft Implants for Hemodialysis Treatment. Gebhard T, Bryant J, Grezaffi J, et al. JVIR 2013:24:543-549. Outcomes comparison of HeRO and lower extremity arteriovenous grafts in patients with long-standing renal failure. Steerman S, Wagner J, Higgins J, et al. J Vasc Surg 2013:57:776-783. Hemodialysis Reliable Outflow (HeRO) device in end-stage dialysis access: A decision analysis model. Hart D, Gooden C, Cummings LS, Wible B, Borsa J, Randall H. J Vasc Surg 2013:58(5):1437. A Novel Two-Stage HeRO Graft Implantation Technique that Avoids the Use of a Femoral Bridging Hemodialysis Catheter in Selected Patients. Yoon W, Lorelli D. J Vasc Surg 2013:58(5):1437. 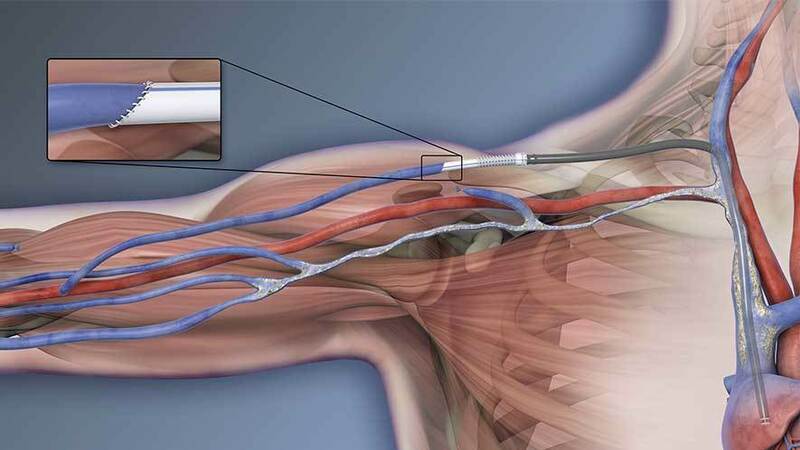 Balloon-assisted over-the-wire technique for placement of the venous outflow component of the Hemodialysis Reliable Outflow (HeRO) device. Ferral H, Behrens G, Turner Y et al. J Vasc Surg 2013:58(4):1117-1119. Wallace J, Chaer R, Dillavou E. J Vasc Surg 2013:58(3):742-747. Downhill varices secondary to HeRO Graft-related SVC Syndrome. Pillai U, Roopkiranjot K, Lakshminarayan N, et al. Semin Dial 2013:26(5):E47–E49. Lifting the Veil: Insights into Vascular Access Options. Kumbar L., Besarab A. CJASN 2013:8(5):708-710. Coan K, O’Donnel M, Fankhauser G, et al. Vasc Endovasc Surg 2013:47:317-319. Experience of HeRO dialysis graft placement in a challenging population. Kokkosis A, Abramowitz S, Schwitzer J, et al. Vasc Endovasc Surg 2013:47:278-280. Experience of a tertiary level academic center regarding the patency and cost benefits of HeRO dialysis access compared to standard synthetic arteriovenous dialysis accesses. Special Nursing Needs for Patients with HeRO Grafts. Allen R, Ladenheim E. ANNA online 4/17/2013. Review of the HeRO (Hemodialysis Reliable Outflow) device: a novel approach for hemodialysis. Politi R, Kawai T, Wu S, et al. JVIR 2013:24(4):S120. The HeRO catheter device is coming to Europe: an Update from previous experience in the USA. Glickman M. CX Daily News April 6, 2013. Prospective analysis of Hemodialysis Reliable Outflow (HeRO) vascular access graft vs. cuffed catheter access in hemodialysis (HD) patients. Provenzano R, LaFleur M, McFadden L, et al. AJKD 2013:61(4):B78. Roddy S, Zwolak R. J Vasc Surg 2013:57:891. Modified use of the Hemodialysis Reliable Outflow (HeRO) graft for salvage of threatened dialysis access. A Clinical Update on an Alternative Vascular Access for the Catheter-Dependent Hemodialysis. Successful Use of the HeRO Device to Salvage a Functional Arteriovenous Fistula and Resolve Symptoms of Venous Hypertension. Early Use Conversion of the HeRO Dialysis Graft. Shawn M. Gage, Hardeep S. Ahluwalia and Jeffrey H. Lawson. Annals of Vascular Surgery, April 2011. An informal quantitative phone survey for 65 HeRO patients was performed via 38 dialysis units in October 2009. Results support earlier HeRO clinical findings, which continue to be favorable for infection rates compared to tunneled dialysis catheters and occlusive events compared to grafts. Long-Term Performance of the Hemodialysis Reliable Outflow (HeRO) Device: The 56-Month Follow-Up of the First Clinical Trial Patient. Percutaneous Endovascular Management of Occluded HeRO Dialysis Access Device. Do access-challenged patients need a HeRO? A Roundtable on Chronic Dialysis.